There is one train of thought that flying West to East is much harder on your body than flying East to West. And vice versa. And people seem to feel very strongly about how they feel, and they will list a million reasons why it is true. For us, and for our kids, it is absolutely a killer flying back home from Europe, so flying East to West is the thorn in our side when it comes to trips. But no matter which way we fly there is no doubt that adding, or taking away, 5+ hours from our kids day is a challenge. 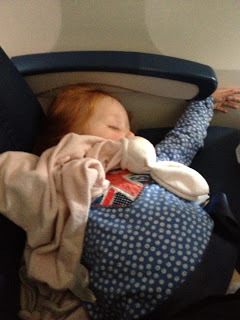 As almost all flights over to Europe are red eyes, and we hit the jackpot with kids who actually sleep on those flights*, it is a huge head start when we land that they have had at least 7 hours of sleep. On our last flight to Spain earlier this month both of my kids, ages 5 and 1, were so tired they slept through the landing and didn’t want to get up when it was time to disembark. Get them to sleep however is comfortable for them without compromising their safety; it is amazing how they can lay across the seat and still have their seatbelt on. After getting off the plane and getting to the hotel we immediately set off outside for some fresh air, which leads me to my number one rule – the more sun, the better! While sun isn’t always an option (hello England my old friend) at least getting your kids outside is important. 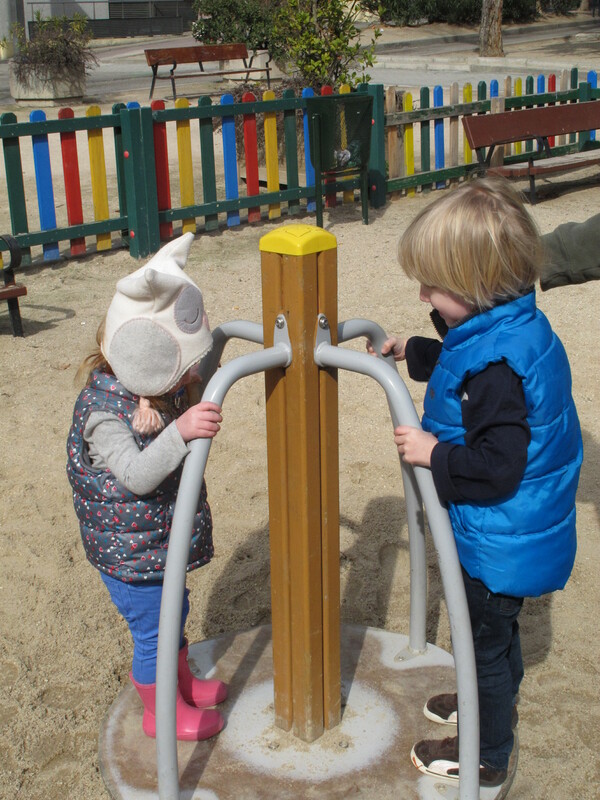 Go for a walk, find a playground, find a park they can run around in, but the more they are outside the better they will do with adjusting their body clocks. We also make sure they have lots of water and snacks. After some outside time (and food) our second rule is naps – allow your kids to have them when they seem like they need them but never let them go too long, especially on the first day. Even our 5 year old, who decided napping was not his thing at a very young age, will nap on the first day of an overseas trip, but we never let it go over 2 hours. Waking up at that 2 hour mark is tough, and often the kids don’t want to get up but once they do please refer to rule one and get them back outside! Rule 3? Stop worrying about schedules. Your kids will not go to bed early their first night. Even though it seems counter-intuitive, when they had less sleep than normal the night before, but they just won’t be ready for bed at 8. Or 9. Or probably even 10. So be ready for a late first night, and probably second, but they will make up for it in the morning by sleeping much later than normal. Which leads to Rule 4 – Don’t let them sleep too late the next day! While it would be nice for everyone to sleep til noon the sooner you start trying to get them onto their new time the better. We usually wake them up by 10, get some breakfast (which, thanks to jet lag may or may not be eaten, and if not don’t worry, they will make up for it soon) and get going, out in the fresh air. We are still in the stroller phase of life with one of our kids, so we let her body do what it needs to and if she falls asleep in her stroller in the middle of the day we let her sleep. If our 5 year old is tired and the 1 year old is not we let her walk and let the 5 year old climb in the stroller and take a short snooze. Basically, rule 5? Listen to their cues, and go with them. Every child is different, but we have found that with both of ours it takes 2 days to get back on their schedule. It may be a different schedule than what they normally have, but it seems to be a schedule for wherever we may be. Flying back home is an entirely different scenario, and deserves a post of its own! What works best for your kids when traveling across time zones? *I know people who swear by using things like Benadryl, or melatonin on kids. I have no idea if these would work (I do know if you plan on using Benadryl, or probably anything, you should try it out ahead of time because Benadryl could have the opposite reaction on kids and that is the last thing you would want when stuck on a flight), but talk to your doctor before using them and make sure it is okay for your child. This entry was posted in Uncategorized and tagged flying East, jet lag, sleeping on planes on March 29, 2013 by andrea922.